Turkey’s family affairs minister has been escorted to the Dutch-German border as crowds of Turkish protesters rallied at the consulate in Rotterdam. The minister was earlier prevented from staging a pro-Erdogan rally outside the diplomatic premises. Fatma Betul Sayan Kaya was detained by the Dutch police at the consulate before being further escorted to Germany, RTL News reported. "Minister Kaya is on her way to Germany, accompanied by police. Her car is being driven back. This also applies to her guards and employees," Rotterdam’s mayor Ahmed Aboutaleb told news agency NOS. In a televised statement, Aboutaleb accused Turkish officials at the general consulate of “misleading” him on the forthcoming visit of Kaya. The mayor claimed that the Turkish consul general told him nothing had been planned for that day in the consulate. “He outright lied,” Aboutaleb said, adding that he was also offended by the comparison of the Dutch authorities with fascists, made earlier by Turkish President Recep Tayyip Erdogan. “He forgets I’m the mayor of Rotterdam, which was bombed by the Nazis,” Aboutaleb said. Reporters live tweeting from the scene said that after the detention was announced, the minister remained in her armored car until a truck arrived to tow the vehicle. She then reportedly came out of her car to be escorted away in another vehicle. — NOS (@NOS) 12 марта 2017 г.
Kaya responded to the detention by accusing the Dutch of “tyranny and oppression,” unlawful treatment and violation of human rights and freedoms on her Twitter account. 4) As an elected Minister, a Turkish citizen and a woman l will never give up against this unlawful treatment. Earlier, with mass rallies still ongoing at the consulate, the Dutch police asked Kaya to promptly leave the country for Germany, accompanied by a police convoy. However, the minister reportedly rejected the request, after police refused to let her address the protesters, NOS correspondent Robert Bas reported. — robert bas (@robertpbas) 11 марта 2017 г.
Turkish Prime Minister Yıldırım said the conduct of Dutch authorities towards the deported minister was a mistake, as he accused them of “violating all diplomatic and international rules” by disregarding her immunity in a statement Saturday, as cited by Haber. He urged the members of the Turkish community to stay calm and argued that the best response from them would be a positive result in the constitutional referendum in April. By banning the arrival of Turkish officials, “the Netherlands is violating the Vienna Convention, which guarantees the rights and the sovereign status of embassies,” John Bosnitch, a Belgrade-based political analyst, told RT. Amsterdam’s move represents an “unheard violation of international law,” he maintained. “The entire incident only comes literally hours after Russia and Turkey announced that they had normalized relations between the two countries,” he said. “Two countries which were at odds with one another decided to make peaceful collaboration with one another, and suddenly we see Austria, Germany, Switzerland, and Holland banning the presence of Turkish elected representatives or government representatives to take part in democratic debate,” the analyst noted. Commenting on Erdogan’s calling the Netherlands “Nazi remnants,” Bosnitch asserted that the Turkish leader “was not pulling these things out of the bag,” as “more Dutch volunteered in the SS that the Germans did” during World War II. 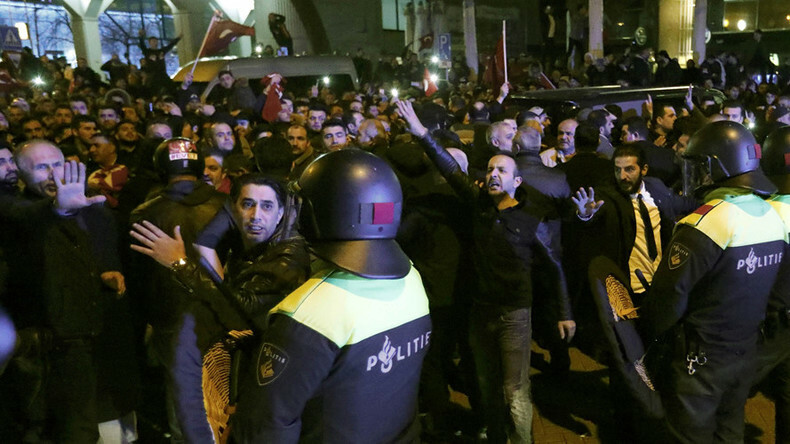 Hundreds of agitated Turkish protesters remained in central Rotterdam despite reports that the action at the consulate was over by the time the car with Kaya left the scene. Riot police cordons could be seen on social media livestreams as occasional rocks and bottles landed near officers. Police later deployed water cannon to break up the rally at the Turkish consulate. Protesters were seen running away from the scene. — Tom van 't Einde 1V (@tomvanteinde) 12 марта 2017 г. The police also reportedly used guard dogs and batons as they were dispersing the crowd. Earlier units of the Dutch Special Intervention Service (DSI) were spotted arriving at the site. Anadolu Agency reports that the Dutch police also blocked its correspondents along with reporters from Turkey’s TRT channel, who were with the minister to cover her visit. Several hundreds of pro-Turkish demonstrators have gathered outside the Turkish Consulate in Rotterdam to protest the actions of the Dutch authorities. The demonstrators were waving Turkish national flags and standing near the consulate entrance. As the crowd grew, the Dutch police took additional security measures at the scene. The police officers put up railings to keep anyone from getting too close and deployed additional forces to the consulate, according to AP. Channels CNN Turk and NTV earlier reported that the convoy of Turkey's family minister was stopped at the Netherlands border. The incident involving the Turkish family minister comes just hours after Dutch authorities revoked authorization for the Turkish Foreign Minister Mevlut Cavusoglu’s flight, hours after he had warned that Turkey would retaliate if his visit was canceled. Earlier, Cavusoglu insisted that he would go ahead with his visit to Rotterdam even if local Dutch authorities did not agree to his taking part in a rally promoting a change in Turkey’s constitution. Cavusoglu intended to campaign at the rally to drum up votes in favor of an April referendum that would give the Turkish president new powers, but Rotterdam’s mayor, Ahmed Aboutaleb, banned the Turkish official from speaking in public in the city late Friday. Meanwhile, the deputy chairman of Turkey’s ultranationalist MHP party, Semih Yalçın, has claimed the Turks were ready to stage a protest at the airport the Turkish Foreign Minister was supposed to land at. Meanwhile, Dutch far-right leader Geert Wilders has also been adding fuel to the fire, tweeting that the Turkish minister should “go away and never come back” and "take all her Turkish fans" as she leaves.